First Line: Her eyes were five centimeters apart. Two unlikely Scotland Yard detectives find themselves hunting for an elusive killer. DCI Michael Sinclair, Lord Acton, is handsome, enigmatic, and absolutely brilliant at solving London's high-profile homicides. When he takes fledgling Constable Kathleen Doyle under his wing, her fellow rookies are jealous, but Doyle is a hard worker and has investigative skills that Sinclair appreciates. Poor, Catholic, and Irish down to the roots of her red hair, she's an odd partner for Sinclair, and they have their work cut out for them in searching for a killer who began with murdering a horse trainer and has busily increased the death toll as the days pass. I've wanted to read this book since I met the author at Left Coast Crime in 2016. 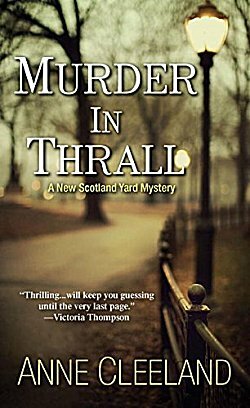 Murder in Thrall sounded like the perfect read for me, and the rave reviews I heard from other readers only increased my interest. I'm sure that you've all heard it said that no two people ever read the same book. That's because we each have our own life experiences we bring with us each and every time we open a book. Well, my life experiences were not well suited to this book. Not at all. Murder in Thrall is told from Doyle's point of view, and she's an interesting blend of intelligence, intuition, and naïveté. This leaves DCI Michael Sinclair very much in the shadows... or at least I thought in the beginning that it did. In addition, the story isn't told in a linear fashion which may be confusing for some people. But I didn't get very far into the book at all before I realized that linear storytelling was the very least of my problems. Speaking of problems, I have one here: how to talk about what bothered me so much about this book without using spoilers. It's going to be extremely difficult. For one thing, I am a reader who doesn't care to read romances. Murder in Thrall is 85% romance and 15% mystery. That percentage just does not work for me. The characters' libidos need to take a definite backseat to the mystery. That does not happen here. Secondly, each chapter begins with what I thought was a glimpse into the killer's mind. It's a technique that's been used in several mysteries that I've read. However, those chapter headings were not from the mind of the killer, and when I realized the real speaker, I was profoundly shocked. If you like a book that's more romance than mystery, Murder in Thrall will be your cup of tea. If heavy overtones of stalking don't bother you, I do think you will enjoy this book. Having been the victim of a stalker, I just cannot recommend this book. Sometime in the future, I will read the next book in this series; it's got so many passionate fans that I just have to give it one more try. I have to let this book dim in my memory first. Source: Purchased at Left Coast Crime 2016. I lend support in terms of no stalkers in books and not liking romances that take up most of the book. I would not read this one. I almost wish I hadn't, but now I know what all the fuss was about.